The status and composition of the People’s Liberation Army (PLA) of the Chinese Communist Party (CCP) appears to be in a state of flux and many attribute this trend to President Xi Jinping’s efforts to consolidate power. For instance, much has been made of Xi’s efforts to streamline the PLA, such as the creation of the Theatre Commands, the reorganization of the General Departments, and his purge of former senior military leaders like Xu Caihou and Guo Boxiong. Likewise, his wear of a combat uniform or his photo in the cockpit of a PLA Air Force combat aircraft demonstrates an overt effort to not only court the PLA but to directly associate himself with them. While many aspects of PLA reorganization represent a necessary step that has been a long time in coming from a military point of view, others suggest that Party politics are still very much in play. Direct or indirect relationships between PLA missions, composition, and behaviour, and internal Party turmoil is neither unusual nor unexpected. As the armed wing of the CCP, the PLA has been an intensely political entity from its very inception. The CCP had to learn the hard way the lesson that many would-be Chinese usurper or revolutionary has over the centuries – that one needs an army to play the game of politics in China. The idea that the CCP controls the “gun” is an oft-quoted dictum, but repetition or even overuse does not diminish in the slightest its importance in contemporary China. But what does it mean to have the PLA’s support and is it really as important as it’s assumed to be? A short jaunt through history is in order to answer this question, or to at least provide context for understanding the implications of how Party politics impacts the PLA, and vice versa. First of all, it is important to note that the PLA was not part of the original CCP vision, and was founded only after the dissolution of the First United Front alliance between the CCP and the Guomindang as a means to protect the Party and its interests. Leadership of the PLA later became one the most decisive issue of the revolution when Mao Zedong and his vision for the CCP and its military strategy won out during the Long March, a 9,000 kilometre retreat conducted by the CCP in the mid-1930s to avoid annihilation. In doing so, he defeated not only his Chinese rivals but, by extension, also curbed the influence of the Communist International and Soviet Union. In essence, the CCP learned, in its most desperate hours, that an army was not only necessary to even be in consideration for political power, but was also a critical factor during internal power struggles. Mao would learn that lesson again during the early PRC-era, as Defence Minister Peng Dehuai sounded the first alarm as to the extent of the Great Leap Forward disaster, leading to an end to those policies and a diminishing of Mao’s standing as paramount leader. Mao turned the tables only a few years later when he enlisted Peng’s replacement, Lin Biao, and elevated his wife Jiang Qing to direct the PLA’s Art and Literature Group as part of a cabal to restore his political power through the Cultural Revolution, a socio-political movement to purge the CCP from within. The PLA would consistently play key roles during the ensuring era, with PLA Chief of Staff Luo Ruiqing, a key potential obstacle for Mao’s schemes, being among the first targets; PLA senior officers challenging the movement during the February Adverse Current of 1967; and the army itself being called into restore order and provide interim stability as the party rebuilt itself. After Mao’s death, Deng Xiaoping presided over the PLA’s withdrawal from governance. Furthermore, he placed a low priority on military spending and instituted a policy of “hiding capabilities,” practical on one hand when China was at a disadvantage militarily, but also cynical on the other in light of his de-emphasis of military modernization. To placate the PLA, he allowed it to enrich itself along with the rest of society, leading to the moniker of PLA Inc. However, partially in an effort to consolidate PLA support, Jiang Zemin reversed Deng’s policy, forcing the PLA to divest itself of its commercial interests in exchange for increased funding and a clear mission – namely, completing the revolution through the conquest of Taiwan. Hu Jintao continued these policies, and in many ways, Xi has gone one step forward, taking a more aggressive stance in the East and South China Seas, and envisioning an expeditionary role for the PLA, potentially in support of his One Belt, One Road vision in Central Asia, Southeast Asia, and the Indian Ocean. 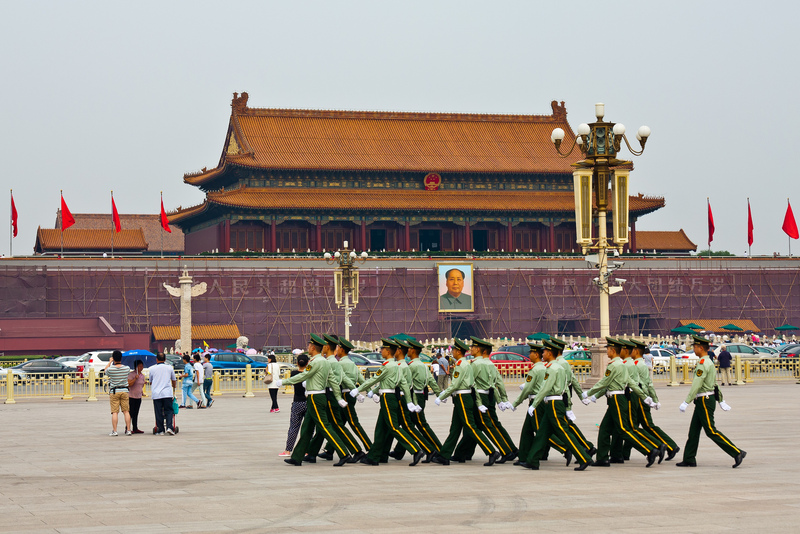 So what does this history mean for the contemporary PLA and its role in both China and abroad? Xi does appear to be following the example of his immediate predecessors by promoting military professionalization as a means of gaining their support, rather than the political or commercial roles seen during the Mao and Deng eras respectively. However, he is also doing so while simultaneously and successfully, at least from an outside perspective, consolidating power across the board. He appears to enjoys a level of consensus within the CCP and a retreat of factionalism that neither Jiang or Hu enjoyed. This factor is most clearly demonstrated in the success of his anti-corruption campaign, which did receive criticism from his predecessors but nonetheless resulted in a purge of high-ranking officials on a scale that had not occurred since the fallout of the 1989 Tiananmen Square Incident. In the end, a professional and outward-looking PLA is a double-edged sword. On one hand, the PLA in this mode is a predictable arm of the state and appears divorced from party machinations which might lead to more radical foreign adventurism, such as its conflict with the Soviet Union starting in 1969. On the other hand, the PLA is being honed into an effective, world-class military organization, able to carry out a coherent policy of expansion, intimidation, and deterrence at least at a regional level. Whether one sees the PRC still on track to enter the ranks of the great powers peacefully, has already achieved this goal, or seeks regional dominance at all cost, the PLA is poised to be able to execute a much wider range of strategic options than the People’s Republic of China has ever previously possessed. However, before we declare a new era and close the book on the PLA as a tool of internal Party politics, it is important to note that this situation is neither the norm, nor is it necessarily sustainable. An important rule of thumb for understanding China is that internal affairs are essential and linked to almost everything, including foreign policy and the use, composition, and doctrine of the PLA. Although there does not appear to be any immediate signs pointing to the return of the factionalism or internal struggle of previous generations, one can never truly dismiss this possibility, especially as Xi completes his term and a new paramount leader emerges from the senior ranks. In such a case, it will be as important as ever to remember the PLA’s historical role and that protecting the CCP from enemies both external and internal is ultimately its most important mission. Christopher Lew is President and Co-Founder of Water Dragons Consulting, Senior China Policy Analyst at SAIC, Adjunct Assistant Professor at the University of Maryland University College, and Major in the United States Army Reserve. Image credit: CC by Xavi/Flickr. Dangerous Waters: China, the USA, and the Western Pacific.